Yes, you read the product name correctly. This is .22 LR ammo loaded with #12 shot. CCI's Shotshell Rimfire Ammo is perfect for backyard pest control. Rats, snakes, and other small pests are no match for this round at short range. This round is quiet, and the #12 shotshell means that you don't need to worry about over penetration. This round is not inteded to cycle in semi-automatic firearms. CCI has built a repuation as the go-to manufactuer for 22 Long Rifle ammunition, so you can have confidence that you are purchasing high quality ammunition. Pick up a few boxes of this 22LR Shotshell today! They will decimate a rattlesnake from standing height distance. 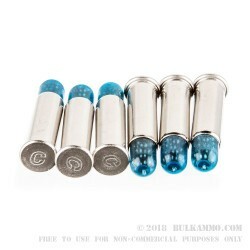 Q: Are these casings able to be reloaded in any way? A: No, it is not possible to reload any rimfire cartridge. Q: Is there any issues useing this ammo in a 22lr revolver because of the cylinder gap? P.S. how many times do you have to reiterate that .22 shotshell will not function in semi autos before people will stop asking? A: No, as long as the revolver is timed properly and is in good condition, that is not an issue. The capsule will keep the shot packed relatively tight until it exits the muzzle. However, you should make sure that recoil is not causing the capsule in the unfired rounds to dislodge enough that it prevents the cylinder from turning before you carry this ammo for hunting or snake defense. Q: This is an interesting load. I have shot a 22LR shotshell once at a paper target. What's the effective limit as far as size of game and distance when used in a standard barrel length rifle? Thanks! A: .22LR shotshells should not be expected to provide tight or effective patterns past 15 feet. The closer you can be to your target, the better. 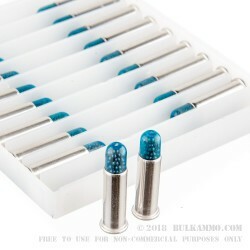 Q: Will this ammo feed correctly in semi-auto .22lr pistols because of the plastic casing at the end? 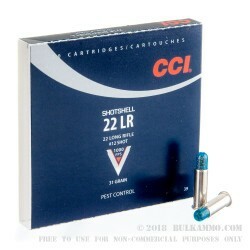 A: This .22LR CCI Shotshell ammunition is not intended to function in semi-automatic firearms. It might cycle in certain semi-auto pistols or rifles, but there can be no guarantee of function in any semi-auto .22LR. Q: I recently used some old (probably 1960's vintage) .22 LR rat shot to dispatch a water moccasin who was an unwelcome guest at my sinkhole. Problem was, it was the old star-crimped stuff, and it did not eject from the Ruger 10/22 that I grabbed in the heat of the moment. Does this CCI stuff cycle normally in a 10/22? A: These CCI shotshells are not designed or intended to cycle in semi-automatic firearms. However, some shooters find that they will cycle in their individual weapon. Q: I have an autoloading firearm, which has a steep feed-ramp, will this load in it, or will the ramp dent the pellet capsule? Thanks! 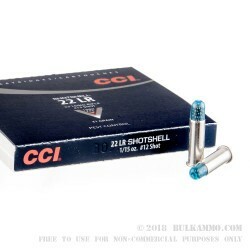 A: CCI states that these 22LR shotshells are not indended for use in semi-automatic firearms. Q: Will this cycle in a Ruger 10 /22 or 22/45? A: This CCI shotshell ammo is not meant for use in semi-automatic firearms. Q: Does the plastic casing holding the shoot leave build up (plastic fowling) on the rifling? and so does the barrel length matter? A: You would have to shoot a huge amount of CCI Shotshells for there to be significant plastic buildup. Even then, it would be easy to remove. As to barrel length, while extremely short barrels will not see the full benefits of this ammunition, it is otherwise not an issue.